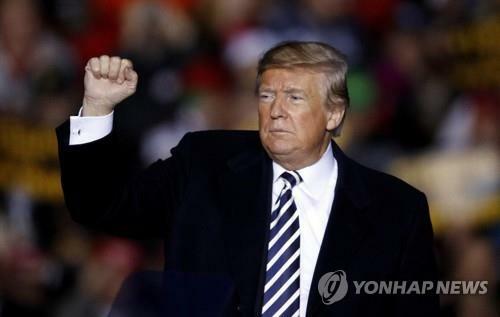 WASHINGTON, Nov. 2 (Yonhap) — U.S. President Donald Trump remained optimistic about the prospects of North Korea’s denuclearization, citing the regime’s invitation of outside inspectors to its nuclear and missile sites. Speaking Thursday at a midterm election campaign rally in Missouri, Trump mentioned the fact that North Korean leader Kim Jong-un has committed to allowing international inspectors into the nuclear testing site in Punggye-ri and the missile engine testing facility in Dongchang-ri. The North has taken steps to dismantle both facilities, but still fallen short of U.S. demands for complete and verifiable denuclearization. “If you read the papers today, it came out to the surprise of a lot of people — not a surprise to me — that they don’t mind having people come over, the experts, and check the sites,” Trump said. “We’re doing well,” he added, listing a series of North Korean goodwill actions, such as the return of U.S. prisoners and remains of American soldiers from the 1950-53 Korean War. Trump said he had a “great talk” with Chinese President Xi Jinping about North Korea, including what he alluded to as the reduction of Chinese trade across the border with North Korea. “The border is holding. And they’ve been honorable. And they’re doing what they said they were going to do,” Trump said. North Korea is under tight international economic sanctions for its nuclear weapons program, and the U.S. has vowed not to lift them until the North denuclearizes. Trump boasted of his “very good” relationship with Kim. Trump is expected to hold a second summit with Kim early next year, after the first summit in Singapore in June produced a statement committing the North to work toward “complete” denuclearization of the Korean Peninsula in exchange for security guarantees from the U.S.